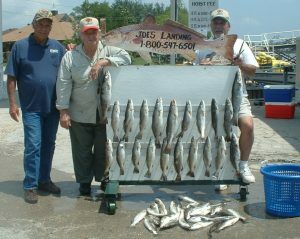 Since 1977, Joe’s Landing has offered guided fishing trips. 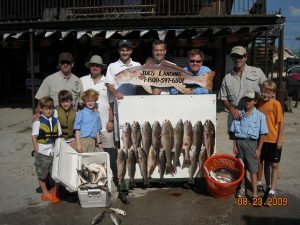 We have more than 15 guides that are U.S. Coast Guard licensed to captain a charter fishing trip and excel at finding fish. We use powerful, well-maintained bay type boats averaging 23′ in length. For your fun and peace of mind., the boats are equipped with both safety devices and quality fishing equipment. Fish Cleaning Trips run from safe light to 1 pm. 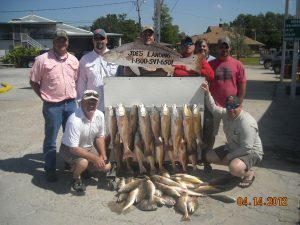 While Lafitte’s reputation for fishing Reds and Speckled Trout is legendary, some anglers come to Barataria’s many lakes and ponds to catch bass. The bass are not as plentiful as other species and but you’ll also see less bass fisherman and more alligators, nutria and other wildlife (see ecotours). According to Louisiana law, everyone fishing on the boat must have a fishing license. Residential fishing licenses cost $22.50 and are valid from the date of purchase until June 30th. Nonresident fishing licenses cost $10.00 and are valid for three consecutive days. Licenses can be purchased at Joe’s Landing prior to your departure. 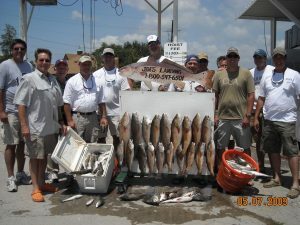 Read excerpts about our fishing trips led by Sid Bourgeois of Joe’s Landing. Titled “Drums Bite Back“, the article was written by sports writer Bob Marshall and appeared in The Times Picayune newspaper of New Orleans on 8 November 2000.